all of this time and no replies? First of all, welcome to the forum..... Very interesting first post. Sometimes things dont get answered. We are all volunteers on this site, no one gets paid to sit here and answer questions. If you have any incite in to the issue the OP has brought up, by all means help out. one more thing. Sometimes posting your questions in the "general" area will yield better results. You will notice that the general forum on the front page has the most traffic! I meant no disrespect. I was just hoping for an answer to the OP. I am having the same issue he had. Thank you for the tip about the "general" area. None taken. You would be surprised at how many people come here and demand things. One guy posted a college final exam and wanted someone to do it for him!!!! Since this site is really run buy "users" its up to us to make sure things are done in a professional manner and to convey what this website is for, which is "CADTutor"ing, not "CADdomyworkforme" and what not. Also, Ive seen people ignored because of their conduct, so that is something to be aware of. Happy foruming! Any new insights on this topic? It is hard to see from the pictures what exactly is going on although it looks like one template (assembly) has been applied then immediately (1m later say) a quite different (in cross section definition) template has been applied. The solution would be to apply the transition over a greater distance (e.g. 10m, not 1m or less as shown). If you are only producing cross sections before and after the template changes (and not in the transition region) then it doesn't matter 100% if the transition is modeled correctly or not - the difference is minimal. The key is feature lines. You need to use feature lines to transition from one corridor to the next. You will have to stop the first corridor then have a transition area that is solely feature lines. This will connect to the second corridor which has a different assembly. 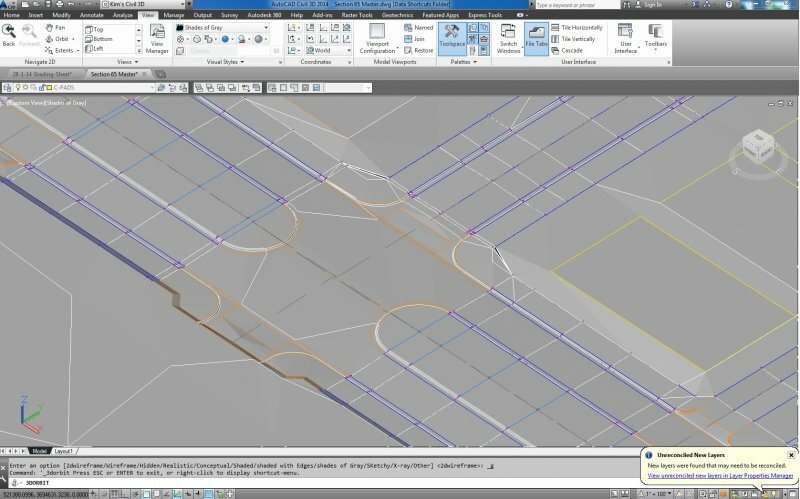 You need to draw 3d polylines in the transition area by hand, then convert them to feature lines, then add them to the surface as breaklines. Here is an example pic where I had a boulevard section with medians, but needed to transition to an area without medians. The orange lines are feature lines that have been added to the surface as breaklines. Very nice work around Pega. 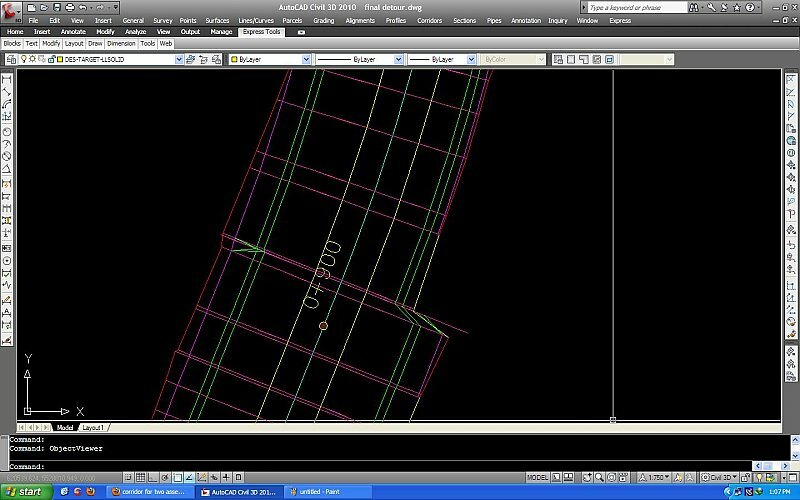 I am working on an area where a two lane road with a 5' wide ditch with no flat bottom transitions into a 3 lane road with 6' ditches with a flat bottom. 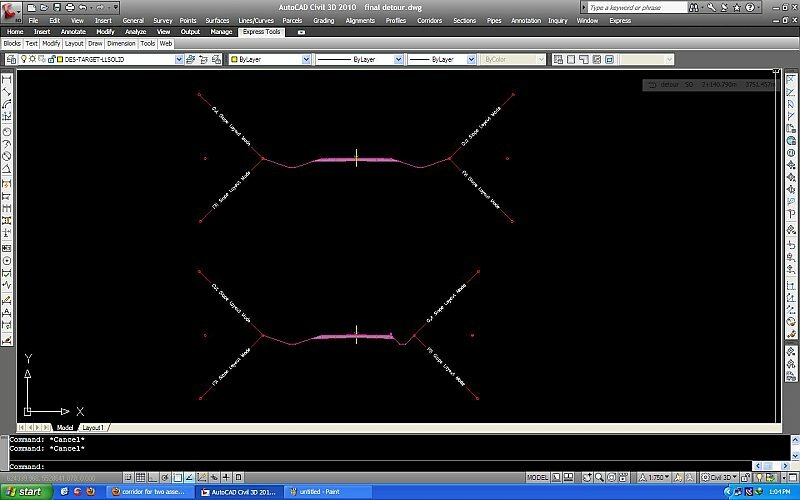 Even though I had created quites a few intermediate assemblys like what Organic was suggesting it did not have the nice smooth transitions I was looking for due to the flat portion of the ditch. I think I'll retry it using feater / breaklines. Nice posting Pega. I have a same problem here (a boulevard section with medians, but needed to transition to an area without medians, just like your example pic). Would you tell me step by step how to use feature lines to transition from one corridor to the next?